Ironically, things used to be easier a few years ago when we got less anime in the UK. If anime companies in Japan have one trait, it’s the ability to jump on a bandwagon. If a genre suddenly peaks in popularity and there’s a breakout hit, then there will be copy-cat shows released by the half dozen within the space of twelve months. Ten years ago, we relied on our local distributors to pick the best of the genre, or if they didn’t, most of us wouldn’t know about it. But with online streaming and the proliferation of anime shows, we tend to get them all, online if not physical. In the past it’s been vampires, zombies, giant robots, slice of life moe, and Oda Nobunaga that have multiplied across anime studios. Now, it’s the idol anime. 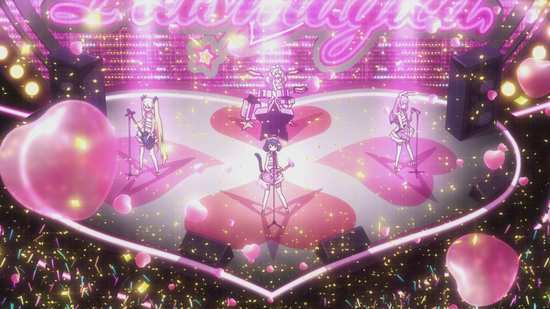 Schoolgirls singing in bands, playing music; everyone wants a piece of that pie, especially since Love Live exploded. It even seems as if Love Live will turn into the anime CSI, opening up franchises in fictional high schools across Japan. With the number of such shows now coming to the UK (Samurai Jam, Super Sonico), it’s easy for them to all blur into one. I have a simple, prejudicial way to evaluate them. How often do I want to stop the disc and watch K-On! instead? 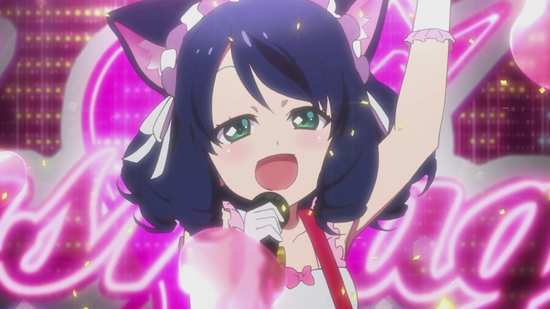 Setting me up for another fall is the next anime idol series, Show By Rock, as Funimation bring us Season 1. There is a season 2 by the way, so it obviously got some traction in its native Japan. Cyan Hijirikawa loves music, plays guitar and writes songs, but she’s painfully shy. It’s taken her long enough to work up the gumption to join the school music club. And then she gets sucked into her phone and transported to another world. 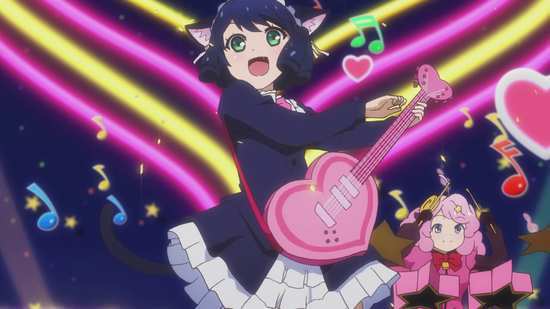 Suddenly she’s a catgirl with a talking guitar named Strawberry Heart. And she’s joined a band too, Plasmagica along with Chuchu, Moa, and Retoree. They’re an up and coming outfit, alongside Shingancrimsonz, for the small company, BRR records. But there are bigger problems in Sound World than just trying to become a hit band. Dark Monsters are abroad, giant apparitions attacking the most popular artists, stealing their Melodisian stones. And it seems only Cyan has the guitar skills and pure talent to defeat these monsters. There is a sinister plot behind it all. 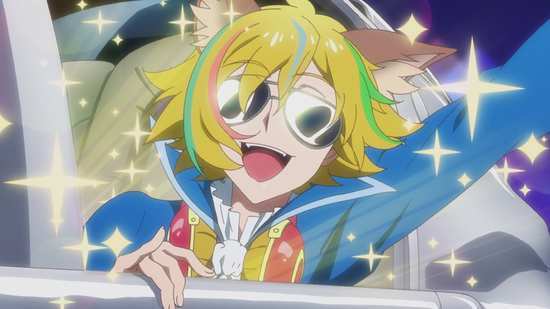 12 episodes of Show By Rock!! 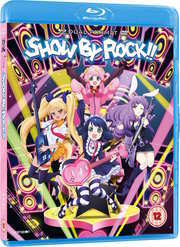 Season 1 are presented in a BD/DVD combo from Funimation. I only received the Blu-rays for review. 1. Have a nice MUSIC!! 12. Our Youth is Non-Stop! 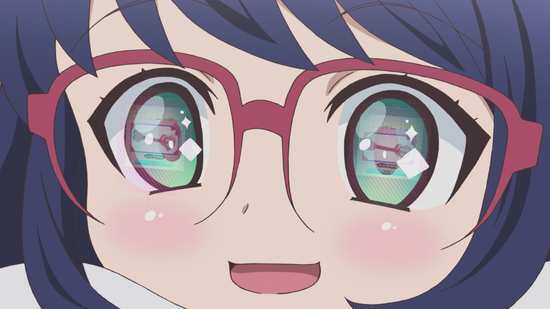 Show By Rock gets the usual 1.78:1 widescreen 1080p transfer that is expected from recent anime. The image is clear enough, offering good detail, and strong colours, reproducing the original source material with the minimum of compression, artefacting or aliasing, beyond the light digital banding that anime never seems to escape from. 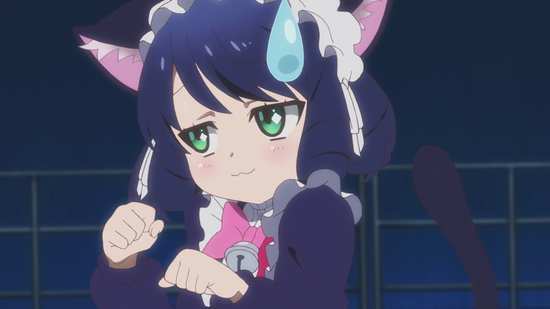 Show By Rock is an odd beast of an anime, a Frankenstein collision of two styles, two methods of animation that shouldn’t work together, and really don’t, but still somehow manages to have a charm of its own. The traditional 2D animation is comparatively mundane when the show starts in the ‘real world’, but it isn’t long before Cyan is pulled into Sound World, a colourful, bright neon world where most of the characters are anthropomorphised animals, Cyan’s a cat girl for instance, and only the main characters are of human proportions. The audiences at the concerts tend to be hundreds and thousands of chibi animals with less in the way of human characteristics. And when the music numbers start or a battle against a Dark Monster occurs, the animation switches to 3D CGI, heavily influenced by stop-motion plasticine characters, and the world turns into TRON world, all neon edges and lines. 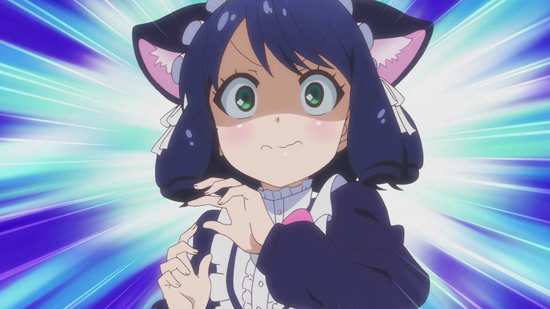 What makes it so odd is that the characters become almost completely animalistic instead of people with animal ears, and oddest of all is that during the songs, they have no mouths, no lips to sync against the lyrics. As I said, it shouldn’t work, but it can have an occasional adorable charm to it that I can’t deny. The images in this review were kindly supplied by Funimation. You have the choice between Dolby TrueHD 5.1 Surround English, and 2.0 Stereo Japanese, with subtitles and signs locked to the appropriate audio track. This is one show where the original language is by far preferable, as Funimation have gone to the length of re-recording all of the show’s songs with English lyrics, and as so often happens with translated lyrics, they don’t flow. The original language audio certainly satisfies when it comes to the character voices, while the music is suitably generic enough pop-rock to get the toes tapping, without really getting you looking for soundtrack CDs. The show still gets a nice amount of space and ambience with the stereo, especially through Prologic. The subtitles are timed accurately, and are free of typos. The discs get static menus. Disc 1 autoplays with a trailer for Ultimate Otaku Teacher. On here you’ll find two commentaries. 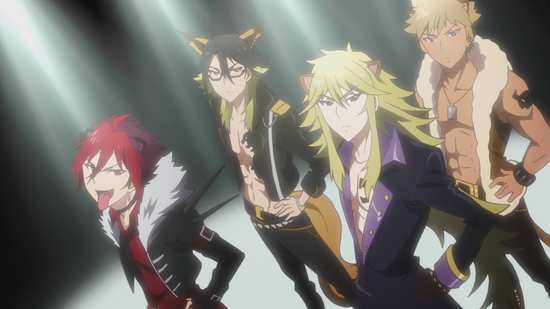 The first is on episode 2, with voice actors Mike McFarland (Crow), Christopher Sabat (Rom), Jerry Jewell (Aion), and Ian Sinclair (Yaiba), the members of Shingancrimsonz. The second on episode 6 features ADR Director and voice of Retoree, Caitlin Glass, Monica Rial (Moa), Alexis Tipton (Chuchu), and Bryn Apprill (Cyan). Disc 2 autoplays with a trailer for Lucky Star. Here you will find 5 promo videos for 5 of the bands in the show, running to a total of around 6 minutes. There are promo videos and commercials for the show, around 2 minutes worth. You get 2 textless openings, 6 versions of the 1st textless closing, and the second textless closing as well. Finally there are trailers for Fairy Tail Part 22, Sky Wizards Academy, Castle Town Dandelion, Summer Wars, Snow White with the Red Hair, and Jinsei Life Consulting. 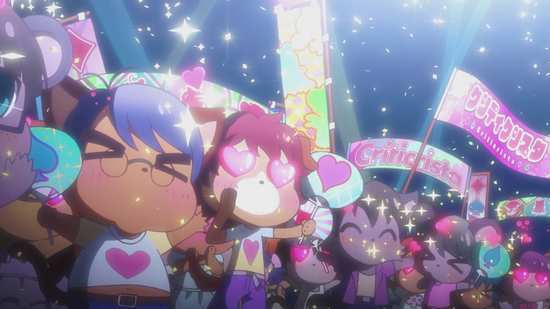 The most memorable thing about Show By Rock!! is its visuals. That isn’t a positive by the way, as this show’s aesthetic is muddled at best, and at worst, downright unattractive, despite its occasional charm. Seeing little plasticine no-mouthed escapees from The Animals of Farthing Wood rocking out is unappealing, and actually made me think fondly of Love Live’s 2D to CG transitions, which I never thought would be possible. The show itself is forgettable, another in the current trend of school girl idol shows, which hasn’t got enough in its arsenal when it comes to story or character to make a lasting impact. But... it is very enjoyable while you watch it. The characters are likeable, the story flows well, and does enough to get you invested in the show, and you’ll feel a little better about the world each time the end credits roll, having been entertained and coddled for the last 20-odd minutes. 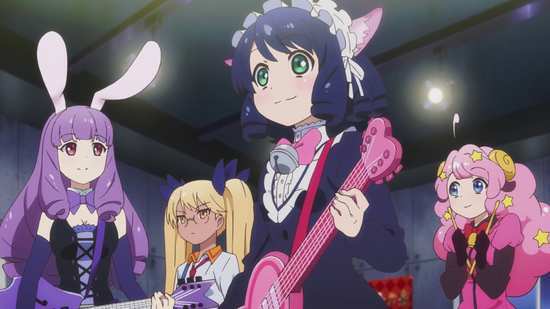 Show By Rock is a gentle, inoffensive show, telling a warm and unchallenging story for broad and especially younger audiences. A young girl named Cyan wants to be a musician, to be a rock star, but she’s afflicted with terminal shyness, to the point where she can’t get past the door of the school’s music club to even join. So when she gets pulled into a fantasy world where everything revolves around music, and where her talents and skills are immediately recognised, even required to save that world from the depredations of the talent-sucking Dark Monsters, you can bet that she’ll be going on a journey of self-discovery and improvement, so that by the time the end of the show comes around, she’ll have the confidence to walk through that door. In this case, the real world situation is an afterthought, and the real adventure, the real emotional investment goes into Sound World, where Cyan winds up after being pulled into her smartphone, and turned into a catgirl. That helps her to fit in given that everyone else in Sound World is anthropomorphised in some way. It also helps raise the moe quotient of the show. Her first encounter is saving one of the more popular bands from a Dark Monster, a giant, shadowy, CG kaiju with an abundance of speakers. It turns out that her guitar skills have the power to defeat the beast, and she’s also alone in wielding a talking guitar named Strawberry Heart, who guides her in this world, and trains her up. Cyan winds up being scouted by a low rent record company run by a Humpty Dumpty lookalike named Maple Arisugawa, and it turns out that one of his two bands, Plasmagica is looking for a guitarist. Soon Cyan is jamming with Chuchu, Moa and Retoree, as they begin their climb to fame and fortune. Chuchu’s the lead vocalist and driving force behind the group, the big-sister type. Moa’s the ditzy drummer who’s also hiding a secret (Cyan has to keep her talking guitar and her Dark Monster battles under wraps), and Retoree is also somewhat shy, technically minded but finds it hard to make friends. It will be unsurprising if the four aren’t the best of friends by the end of the show. The other band on the label is Shingancrimsonz, and they’re the hyper testosterone-y, hard rocking comic relief. What follows over the twelve episodes is the usual routine of training, rehearsal, live concerts, and the occasional battle of the bands, all to get to the Grateful Rock Festival where the supreme band will become apparent. But all the while there is the peril of the Dark Monsters, able to sap talent from their victims, and who Cyan has to deal with, putting her nascent friendship with the band at risk when she has to ditch them. As the series unfolds, it turns out that the Dark Monsters aren’t a natural phenomenon, and that there are schemes and machinations behind it all. 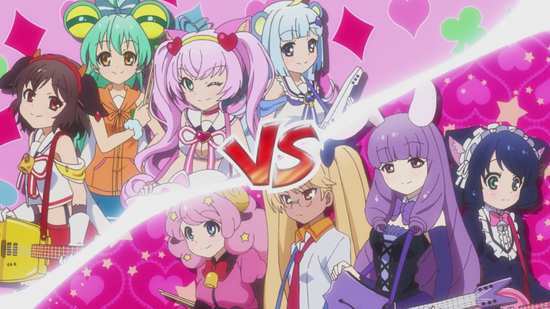 Were it not for the musical elements, Cyan’s battle against the Dark Monsters would be a shonen action show, but the predominantly female cast, the cute girls doing cute things aspect, and the pop songs shifts the target audience more gender neutral and even leaning towards the female, while the scrupulously inoffensive story makes this ideal for younger viewers. The story is entertaining and the characters are appealing, and it unfolds in predictable, but enjoyable ways. If it does have a misstep, it’s close to the end, when Plasmagica suffer from the green-eyed monster and ‘creative differences’. In my opinion it’s resolved far too quickly, and would have made for a more effective and emotionally resonant climax if that storyline had been stretched over the final three episodes. 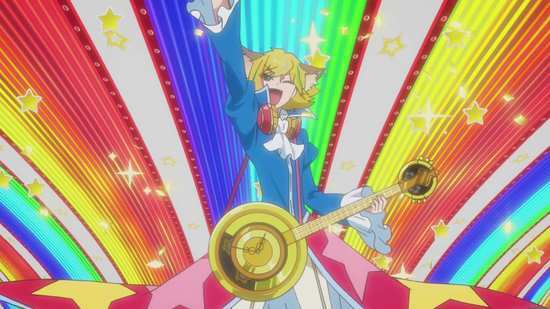 Show By Rock!! is easy to like, but given its competition in the school idol market, it’s not easy to recommend.